I’ve been spending a lot of time on the new Power BI Community site lately, and I have to say, I like what I see. It’s refreshing to see a mashup of so many different types of users coming together to work their way through how to use the product, issues they may be having, or ideas to make it better. Due to the ever growing list of ways to share objects to other users, I wanted to take the opportunity to streamline and simplify some of that information. It is very important that all Power BI users understand where, and how, shared objects work downstream. 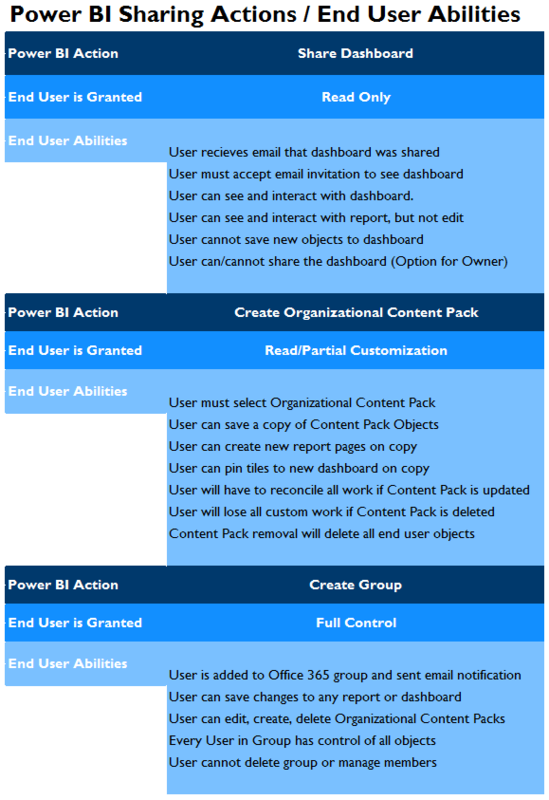 As a result, I created a high level visual to outline what other users can see, and do, when we implement Power BI sharing solutions. The above reference is painting this picture with broad strokes, but it should elicit the conversations necessary to make sure that the data we share with others in our organization is done in the way we intended. Power BI will continue to evolve, and I suspect that the mechanisms for sharing will be adjusted and expanded upon in the future. Feel free to comment and leave suggestions as I intend to keep this reference updated going forward. Have additional Power BI questions? Ask the Community!